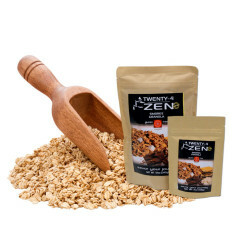 Rock your world with Twenty 4 Zen Gluten Free, Vegan, Soy Free, Gourmet Granola. We offer a snack /breakfast/anytime treat that is low in calories, carbs/sugars and fat in the flavors you crave. We’ve designed Twenty 4 Zen to balance the body and spirit by combining sweet and salty, sweet heat and sweet and tangy. All packed with flavor that will keep you feeling Zen Twenty 4 Seven.